"Nothing equals the beauty of Cinderella wedding gowns! If you are a bride who has always wanted to be a princess on her wedding day, then a princess ball gown wedding dress like those in the fairy tales, is what you need to make your dreams come true." What qualifies as a Cinderella wedding gown? Remember the movies based on the story of Cinderella? She wore a beautiful big ballgown dress! Guess what? Now you can find wedding dresses that are designed based on the Disney's iconic princesses! In the collection there is a gown style for each of the fairytale princesses including Cinederella, Sleeping Beauty, Snow White, and Belle from Beauty and the Beast. Alfred Angelo has teamed up with Disney to bring the dresses of the Princesses to life! Brides won't be disappointed with the styling of these fairy tale wedding gowns. There is a total of seven gowns in the collection. Here is one of my favorites from the line. 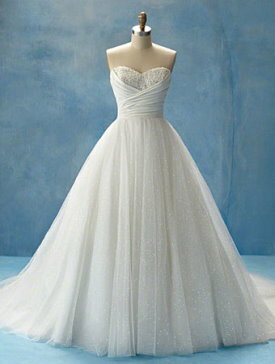 When it comes to Cinderella wedding gowns.... this one definetly, qualifies hands down! Alfred Angelo captured the essence of the Cinderella character with this dress. It is made of tulle fabric, which gives that light and airy flow to the dress. Plus... it is a figure flattering style for most figure types! If you want to find out more about Alfred Angelo wedding gowns read my review. Check out this next one by Victoria Bridals!!! Isn't this elegant! If you love ruffles this is the gown for you! You will definitely have the full ball gown princess look with this gown! And if you are not a fan of strapless wedding dresses, this is a great choice for you! This gown is especially complimentary for the large busted body type because of the V-neckline. But if you are self conscious about showing cleavage, a modesty piece can possibly be added to this style. The hourglass shape, rectangle shape and some pear shape figure types may also find this dress complimentary. Doesn't this next dress fit what you imagine Cinderella wedding dresses to be? The flare starts lower, more around the hip area. This style is great if you have a rectangle body shape because it has the asymmetrical waist detail. This style can work for you if you have an apple shape body type, because the waist detail and the full a-line skirt can hide your stomach area. The bridal gown below is the perfect choice for the hourglass figure type. It really shows off your curves. Also this bridal gown can be a good choice for you if you have a large bust. Here is a Cinderella wedding dress with a full ballgown. To add to the fairy princess look you get extra pouf from the 3-D fabic effect on the skirt. This is a real cake topper wedding dress! A wow factor dress, fit for the princess wedding dress look! The detail in the skirt is stunning! This one is definitely a Cinderella wedding gown. It has a regal air about it, a royal wedding dress look fit for a queen! This is a timeless design, one you could heirloom and save for a daughter who might want to wear your gown! Full skirt princess wedding dresses can be overwhelming for your body frame. They tend to make you appear shorter, because they are so wide. You would need to be at least 5'7 with heels on to pull this ball gown wedding dress style off successfully. Another thing you need to know is that small busted brides have a hard time keeping a strapless neckline in this style from sliding down, because of the weight in the skirt. So it may be very hard to get this style tight enough so that it is comfortable for you to wear. When it comes to Cinderella wedding dresses a tall bride can wear this style the best! Because of the wide full skirt, it can make you appear shorter in height. Which may be something you may not mind. The above gowns are of course just a few of the many Cinderella wedding gowns available. Hopefully the styles above and the tips given will help you pick a bridal gown that will flatter your figure. "I am sure you will find the perfect wedding dress that will make you the princess bride you have always imagined!" Take a look at these gorgeous dresses in this affiliate shop full of ball gowns and dresses that fit the fairy tale wedding gown theme. Read these buying tips before you buy a tulle wedding dress. Was the information helpful? Do you see a dress style you like? Do you have a picture or a story to share? Do you have a question? Then here is your chance to be heard! Note: Be aware that this is a public forum. If you want your question answered privately, then use the Contact Me Form. Note: Please make picture sizes no more than 800x600. Thanks!